Within each of us is the essential energy which motivates our physical movement each day. That essence, or prana, is revitalized through practices such as Yoga, the ancient path to unity of body, mind and spirit. We follow the mantra; healthy body, healthy mind. Healthy mind, healthy spirit. Healthy spirit, healthy family and community. The Zion area is an amazing place to practice Yoga, because the raw energy of the land is so poignant that it quickly elevates our own energy levels. Even simple conscious movements are amplified in their affect. We do a short hike right on the outskirts of Zion National Park on the very beautiful Springdale Trail to a private overlook facing The West Temple. This hike offers a unique communion of physical and meditative movement with amazing views. We hike for approximately 20 minutes each way on the trails and integrate and additional 45 minutes of dedicated yoga practice. Our Yoga Guides specialize in Hatha Yoga, Kundalini Yoga and Mantra-Medicine. Meeting Point: Arrive 5 to 10 minutes early. Meet at Zion Guru. Must register/pay at Zion Guru no later than 12 hours before scheduled hike. Enhance the quality of all aspects of your visit. Yoga is an amazing way to truly integrate the majesty of your experience near Zion. Private Yoga experiences can be customized and integrated into your travel plans and activities including hiking, canyoneering, private, daily classes in the field or at your lodging. With all private yoga hike, we provide greater flexibility of start times, locations, and yoga styles, group focus and intentions, 3 - 4 hours in duration. Inquire about custom start times. We will recommend based on sunrise/sunset, seasons, weather conditions, etc. The rugged wilderness surrounding Zion National Park offers remote exploration of deep canyons and epic heights. Are you ready to explore yourself in the same way? We all have boundaries of fear and physical capacity. The guides at Zion Guru have made a habit of exploring their own and will guide you as your boundary approaches, rappelling off a cliff or climbing a rock wall. Yoga, mindfulness, meditation...these are all synonyms for connecting your physical, mental and emotional experiences. Harnessing this single-pointed awareness allows us to explore why we feel such doubt in our capabilities or the feeling of retreat when we are triggered by an uncomfortable situation. You will be lead on a mindful exploration of physical and internal terrain. Allow yourself the space to work through your boundaries under the guidance of a highly trained professional. Your day will begin with conscious movement led by your guide, a professionally trained certified Hatha yoga instructor (Yoga Alliance), in a remote location offering stunning views of Zion National Park. By being open with your guide, he or she will design a custom adventure congruent with your goals and hopes for the session. 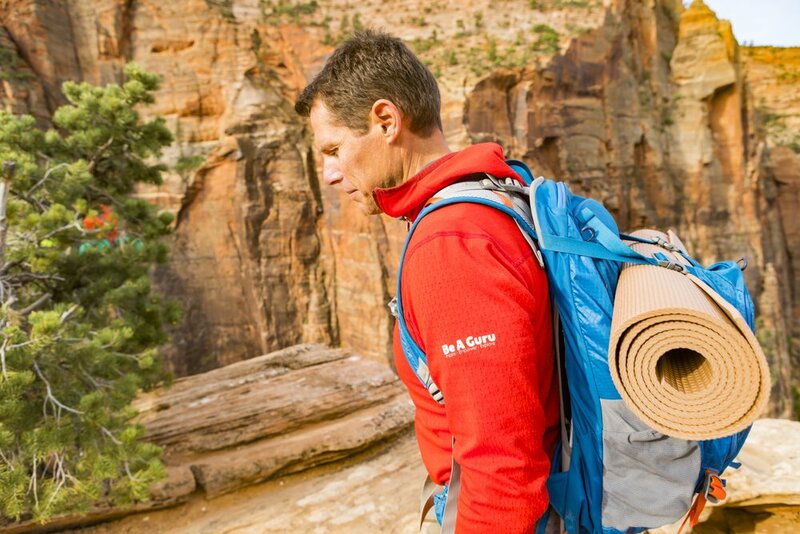 Choose between canyoneering, rock climbing, or even climbing Angel’s Landing when you never thought you could. FOR RESERVATIONS: Please contact us so we can help you customize your Adventure Yoga Quest (half or full day). Yoga mats are optional, and we encourage the natural contact with the earth, soil, and rock. We have yoga mats for rent for an additional $5/person. Sarah has lived in Utah’s extraordinary redrock desert for the past 10 years. She is an avid hiker and explorer, and as a former archaeologist loves to discover prehistoric sites throughout the desert southwest. Sarah’s yoga teacher training program focused on the breath and body movements of Ashtanga yoga with the precise alignment of Iyengar Yoga. She likes to combine flow with slower intentional work to awaken deep resources of awareness and freedom in the body. She incorporates Zion’s incredible backdrop of immense canyons and peaks to bring out deep inner resources of strength and stability throughout each session. She believes yoga is for everyone and will create a specific practice based on individual needs. Sarah has lived in Zion Canyon since 2008 and loves to share the beautiful backyard she loves. An avid rock climber, mountain biker, and hiker, she has been practicing yoga for 12 years, specializing in muscle alignment yoga for athletes or activity specific stretching and strengthening. Sarah is a local hiking and canyoneering guide, and also teaches all levels community classes in the area. Joe was introduced to Yoga while serving in the United States Marine Corps in 2011. After leaving the service he travelled to Nepal where he was trained in Hatha Yoga. Joe specializes in yoga for the yoga skeptic, breaking down concepts in Eastern philosophy such as chakra and prana in a way that makes sense to a Western mind. Joe’s own practice is focussed on the internal union of his physical, mental and emotional experiences, supported by Asana (posture), Pranayama (breathing techniques) and Meditation. Yoga is more than just aerobics - it is a personalized structure to rely upon when you sense imbalance in your life. Mandeep Khalsa is a licensed and certified Yoga and Meditation Teacher for over 20 years. She embraces the teachings of Kundalini Yoga - the Yoga of Awareness - and teaches them accurately and authentically from the heart. Mandeep lives fully and deeply in these tumultuous times by creating the change she wishes to see in the world through her own actions, thoughts and environments. She is the creator of the "Sage Hills Self Elevation Station" in Cedar City. Atonka is a compass of boundless love, endlessly giving to create new life. In the soulful depth of her eyes she describes her way in the realization that being yourself holds the quintessence of all healing, language and heart knowings, at all levels of consciousness and understanding. By being who you truly are, it awakens ALL of you. It awakens the existence of true life, where there is no beginning and ending, but a oneness of a complete embrace where boundless love, energy and infinite sharing is possible. With a background in Traditional Chinese Medicine, Tao Holistic Healing, Yoga and Qigong, Atonka actively shares movement, principles and practice with you, as a tool for you to use, to experience purification, healing and harmony, to help awaken potential and possibilities at your own levels of consciousness and understanding.